SF Taxi Media: You Asked For It, You Got It! How the Medallion Sales Pilot Program has affected Yellow Cab. By John Han. You Asked For It, You Got It! How the Medallion Sales Pilot Program has affected Yellow Cab. By John Han. Yellow Cabs. Photo by John Han. According to Yellow Cab, the City's largest taxi fleet has had about 25 medallions switch to Affiliate as a result of the Medallion Sales Pilot Program. That's with about 84 medallions sold so far, with more to come. That's okay if you happen to be one of the new medallion buyers. In fact, it might be a version of the American dream. It could also be pretty cool if you're one of the drivers hired on by those Affiliates. 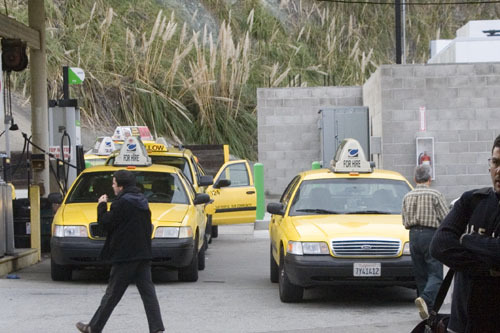 But if you're Yellow Cab, or if you're a gate and gas taxi driver there, that's starting to mean some uncertainty. The landscape of the industry is clearly changing. And the industry has to decide what to do. Morning shift drivers at the company are now having to come in, for example, on Wednesday in order to work on Thursday. I'm confident Yellow Cab's management could confirm this. Why? Because most new drivers on day shifts, for example, start off with Saturday and Sunday shifts only. That's by company mandate. They're typically given two shifts a week and then are told that they may come in on their days off and work unassigned shifts to make up more hours. This may seem harsh against workers looking to start off with full time hours, and it is harsh. However, an upside is that it offers flexibility to others. Conceivably, drivers can work seven days a week under this method. That's how it's worked for a long time up until now. Under the Medallion Sales Pilot Program, the drivers coming in on a Wednesday to play the 5 AM lottery, for example, are finding out more often than not that the company no longer has enough medallions to get everyone out. With twenty-five medallions switched to Affiliate, the company now can get only some of those drivers out on a regular basis. The rest must go home but will subsequently be given priority on the following Thursday morning as carry overs. So a common expression now amongst drivers is, "in order to work on Thursday, we must show up at 5 AM to play lottery on Wednesday," and, "to work three or four days a week, we must come in to the company seven days a week and try." If anyone is wondering why you never see these kinds of drivers at meetings, it may be because they're at the cab yard waiting and hoping to earn a day's income. If they happen to get out in a cab, they're not going to sacrifice that time in a meeting. And if they don't get out, they're still probably not going to be encouraged to go to a meeting, even if they should. Yellow has just posted a notice informing drivers that there will be no more 5 AM Thursday lottery because the spill over of drivers from Wednesday's lottery is too numerous. Some drivers claim that they showed up at 5 AM on Wednesday and were carried over as far as the following Friday. Not that the City cares. What should grab the City's attention though, is that Yellow Cab says this is a concern for the company itself. If the trend continues where the company's medallions keep switching to Affiliates, the company could be in serious financial trouble. Everyone who's been paying attention knows this. It's only a matter now of whether the City and everyone else cares if Yellow survives or not, or if it gets plunged into being nothing more than a dispatch service. Finally, I was recently offered a choice of full-time or part-time schedule with an Affiliate who made a kind offer. I was even offered my choice of days. Now, EVERY SINGLE DRIVER that I've talked to who drives for an Affiliate or LTL says it's better than driving for a company. I was flattered and very grateful for the offer. However, Yellow's policy is you can't drive for the company as gate and gas, and drive for an Affiliate at the same time. Although I was grateful to the owner, I respectfully turned down his offer in favor of remaining loyal with the cab company. I hope Yellow's management would recognize this, as I am much more expendable to them than they are to me. Here's an illustration of Yellow Cab's loyalty that happened over 20 years ago. While talking with Ted, the Mon-Wednesday night dispatcher who is now dead, his phone rang. He repeated what whoever called him said, "So you want me to only give him one envelope, the smaller of the two, not the thicker one, right?" He then added, "You guys are heartless." Moments later, a driver named Yale, who had been with Yellow for decades, approached the window where Ted and I stood, and Ted gave him the smaller of two envelopes. Yale nervously opened the envelope then happily announced that he still had his job. I asked what was up, and it turns out that a troubled woman had recently tried to kill herself by jumping in front of Yale's moving taxi. The police report stated that only due to the cab driver's quick response and evasive actions, the lady lived. I then told Yale that there was another letter at the window for him, and he went to ask Ted. Ted looked at me then gave the second letter to Yale. The first letter was from management asking Yale to go to small claims court to testify on Yellow's behalf on an unrelated issue. The second letter told him his weekly agreement was not being renewed, but they didn't want to fire him until AFTER he testified for them. They figured if they fired him, he wouldn't help them out, so wait to fire him until they got what they wanted. I think I saw Yale's name around although he's up there in years now. Anybody know him, please give me his contact info; I'd love to say hello. Yale was able to leverage his new-found knowledge into keeping his job, but that AIN'T loyalty; it's pragmatism on Yellow's part. I have several more examples, so John, FORGET loyalty; it only exists among human individuals, not corporate entities. The advantages of having a regular cab and regular shift, kept clean by other regular drivers, are real. Loyalty from a legal entity that manages a cab company is not real. Their fiduciary responsibility is to their shareholders, not to the drivers. You are a nice guy; a corporate entity is not. Maybe that was Yale Feder. He just sold his medallion that he got 3-4 years ago. He had been driving at least since I first knew him at YCC in 1984. He lives on Colusa in Berkeley unless he moved which I doubt. Bill I've heard a good many stories about the current management at Checker Arrow. One guy that works for me now said he was at Arrow/Vet's for 17 years and came to work one day and was told the medallion he was driving on was leased so "good bye. " He claims he said "Can I get my tip back?" and was told "Well if that's the way you are going to be Ok"
I'm not certain the choice I made is the right one, but I'm certain it's the one I made and will live with. Out as they are doing to the drivers? Able to no one, so who are the cab companies to resist? Move, if they want to have viable livelihoods,that is. Drivers that end up driving on a long lease often get scwred around more than they do at companies. It is often that a driver like this gives abid deposit and pays for damage no matter whose fault it is. If a big convention is here they often take a shift from a guy to work themselves. And of course paying more gate than is allowed is rampant. Went to one of the medallion financing meetings at the San Francisco Credit Union held on the Thursdays his last 2 weeks. For most people they will be funneled into a 25 year loan unless they don't need down payment assistance. Although the person is gaining equity in Medallion the program is really a 25 year plan of INDEBTED SERVITUDE. Shameful the city is getting rid of current medallion list to help staunch corrupt out of control spending, on the overly exploited cab drivers. First thing sfmta should do is include cab drivers on a health plan other than healthy San Francisco. Same plan that Bus drivers get what ever that is. If SFMTA is going to control cab drivers like employees then we should get perks of being employees that starts with health plan like other city workers. The same thing is happening at Luxor. Between the sale of the medalions and John Lazar pushing Medalion holders to go to Long Term Lease (or color scheme) those of us that are Gate and Gas drivers are slowly becoming unemployed. and pays to Iqbal. Said to be 30 medallion. Is he a broker ? ?